A light rain was falling and grey clouds hung low over the rolling French countryside, producing premature twilight as three sleek prototype automobiles rolled across the finish line to end the 24 Hours of Le Mans for 1966. So began the last press release that Ford issued from Le Mans in 1966. That race became the subject of a book by A.J. Baime titled “Go Like Hell!” – the words shouted by Bruce McLaren to Chris Amon as they drove to their famous victory. Fifty years on from that historic 1 2-3 finish for the Ford GT40 at the world’s greatest endurance race, Ford is back. The four Ford GTs run by the Ford Chip Ganassi Racing team took to the track at Le Mans yesterday (June 5th) for the official Test Day. This was the first time the Ford GTs have run at Le Mans as the team prepares for the 24-hour race that starts at 15:00 CET on June 18th. The Ford GT race car is based on the new Ford GT supercar – the most advanced Ford production vehicle ever, featuring the latest in light-weighting, aerodynamics and EcoBoost engine technology, and an innovation showcase for the Ford brand. The Ford GT has been built to take on the toughest competition from Ferrari, Corvette, Porsche and Aston Martin in the ultimate battle of speed, endurance and efficiency. In 2016 Ford Chip Ganassi Racing is running two Ford GTs in the FIA World Endurance Championship and two in the IMSA WeatherTech SportsCar Championship. The WEC team, in only their second race, recently took second place at Spa Francorchamps in Belgium, putting them in second place in the WEC drivers’ and teams’ standings going into Le Mans. The IMSA team have four races under their belts and crucially the first race victory for the Ford GT after a great win at Laguna Seca in the U.S. This result moved them up to third place in in the IMSA drivers’ and teams’ standings. "It is exciting for me personally and for all of Ford Chip Ganassi Racing to be going to Le Mans to race, especially given the 50th anniversary of Ford's historic 1966 win,” said Chip Ganassi. “We have enjoyed racing the new Ford GT this season and expect to be strong at Le Mans." 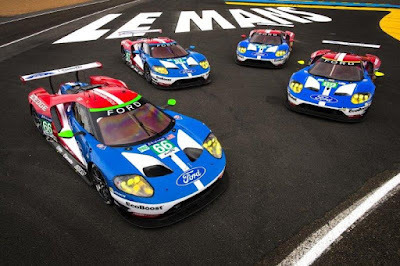 The two WEC Ford GTs retain their #66 and #67 race numbers for Le Mans while the IMSA cars become #68 and #69, celebrating Ford’s Le Mans victories in 1966, 1967, 1968 and 1969. Chip Ganassi has been a fixture in the auto racing industry for over 25 years and is considered one of the most successful as well as innovative owners the sport has anywhere in the world. Today his teams include four cars in the Verizon IndyCar Series, two cars in the NASCAR Sprint Cup Series, one car in the NASCAR XFINITY Series, two factory Ford GT’s in the IMSA WeatherTech SportsCar Championship, two factory Ford GT’s in the FIA World Endurance Championship and two Supercars in Red Bull Global Rallycross. Overall his teams have 18 championships and 170 victories, including four Indianapolis 500s, a Daytona 500, a Brickyard 400 and six Rolex 24 At Daytonas and the 12 Hours of Sebring. Ganassi boasts state-of-the-art race shop facilities in Indianapolis and Concord, N.C., with a corporate office in Pittsburgh, Penn.